Derek is a bittersweet comedy drama about a group of outsiders living on society's margins. Derek Noakes (played by Ricky) is a tender, innocent man whose love for his job and the people he cares for shines through. He's 49 years old and loves animals, Rolf Harris, Jesus, 'Deal or No Deal', 'Million Pound Drop' and 'Britain's Got Talent' - but his main hobby is autograph hunting. He works in a retirement home with his mate and landlord, Dougie (Karl Pilkington in his very first acting role). Derek cares deeply for old people because they're kind and funny and tell him stories about the olden days. Hannah (Kerry Godliman) is a care worker at the home and is Derek's best friend. She's smart, witty and hard working, but unlucky in love; and like Derek, always puts other people first. 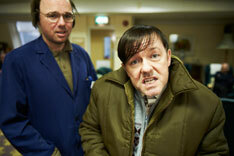 A one-off pilot episode of Derek was broadcast on Channel 4 on April 12th 2012. The first full series began early in 2013 on Channel 4 and will be available on Netflix from Sept 12. A second series in on the way. Backstage chats with Ricky as 'Derek' is nominated for a Golden Globe. Derek has been nominated for a TV Choice Award. 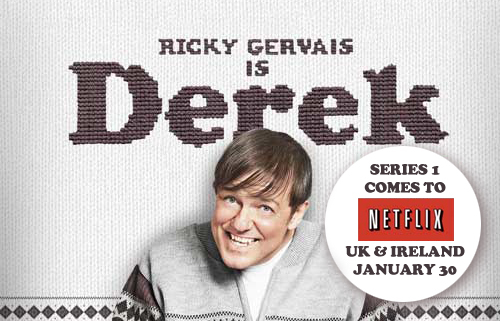 With Derek coming to Netflix UK on Jan 30th, Ricky talks to Bloomburg TV about his latest creation. Ricky chats to the Sydney Morning Herald. The National Television Awards have opened voting for the January 2014 awards. You can give your support to Derek in the poll here. An audience with Ricky in New York hosted by the New York Times. 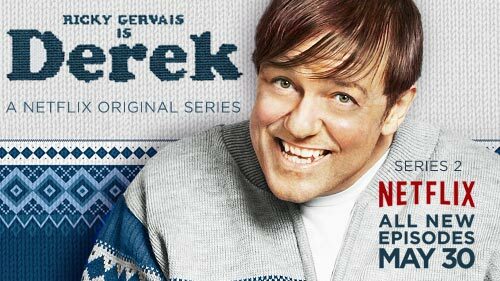 Entertainment Weekly calls #Derek "marked by grace." Ricky talks to Brad Blanks on the red carpet of The New York Premiere of Derek. Listen to Ricky's interview on Black Sky Radio. Watch the footage from the Hollywood Reporter's interview with Ricky. The Psychologist looks at Derek. Ricky talks about hurting people's feelings, never reading books, and why Derek makes him well up. 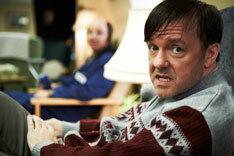 Ricky and the central cast of Derek talk to the Radio Times about their roles. As Channel 4 gets ready for Derek's full series premiere on January 30th, their catch-up service 4OD is now showing The Making Of Derek. 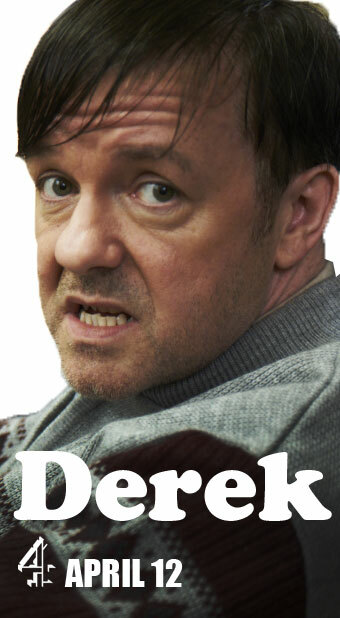 Ricky talks to Reuters about Derek and how it differs from his past shows. Ricky talks to Metro about how people are wrong when they decribe Derek as learning disabled. The New Yorks Shorts Festival 2012 has given Derek first place in its comedy category. The Sunday Times' Minette Marrin gives her verdict on Derek. The Independent's Ian O'Doherty points out the problem with the views expressed by some people who didn't like Derek. The Telegraph is impressed by Ricky's Channel 4 comedy drama. And Metro calls it "sharp, yet sweetly observed"
Ricky talks to the Irish Independent about his new comedy 'Derek' and its potential for controversy. 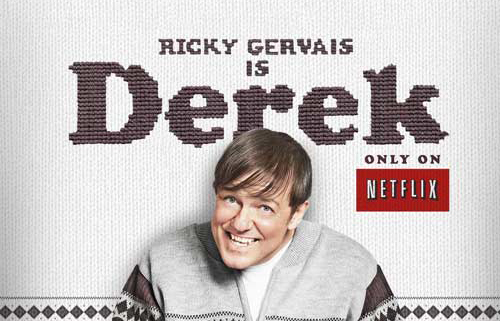 US website CinemaBlend ponders whether Derek will make it on to American TV screens and shares some clips in anticipation. The Sun looks at 'Derek', Ricky's new comdey set in an old people's home, and Ricky takes the opportunity to point out how youth-centric today's society has become. Heat World's verdict on Ricky's new show is in. 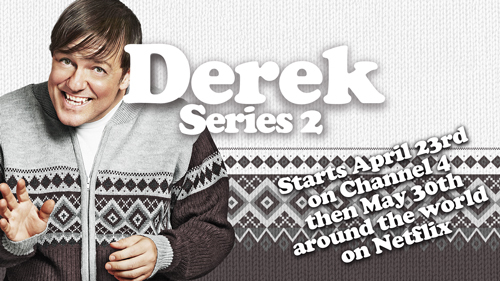 Derek premieres on Channel 4 in the UK on April 12. 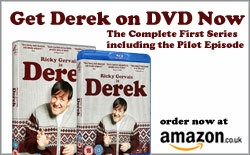 Digital Spy offers an in-depth appraisal of Ricky's new project, Derek, which airs on Channel 4 in the UK on April 12. Ricky's latest project in which he stars as Derek Noakes, who works in a nursing home, will have its pilot episode broadcast on Channel 4 in April.